You know what? The type of shoes that you wear says a lot about your personality, rather than just your taste for fashion. However, some types of footwear do not give away a single hint about your character. A good example is men’s loafers. Here is what you need to know about the best loafers for men. So What Are Loafers for Men? Loafers are classic shoes that do not use any form of lacing or fasteners. In essence, they do not require lacing or tying. You just have to slide your feet into the shoes to wear them and that’s why they are normally referred to as slip-ons. They are normally designed for men, but women loafers are also becoming common in the market. Previously known as Aurland Moccasins, loafers have been a fashion staple since time immemorial. Ever since their emergence, men’s loafers have evolved to become more unique and innovative. What is more amazing is that they offer a splendid bridge between casual and formal footwear, as you can wear them for most occasions without becoming a fashion disaster. Before delving on the different types of loafers, let’s have a quick look into some of the benefits of wearing these distinct shoes. Loafers are extremely easy to wear just like home slippers for men. The shoes are not fitted on the heel subsequently making them easy to get on and off. Furthermore, they do not require lacing, which eliminates the need for bending when tying shoes. This is a big advantage for seniors and other people who lack dexterity. 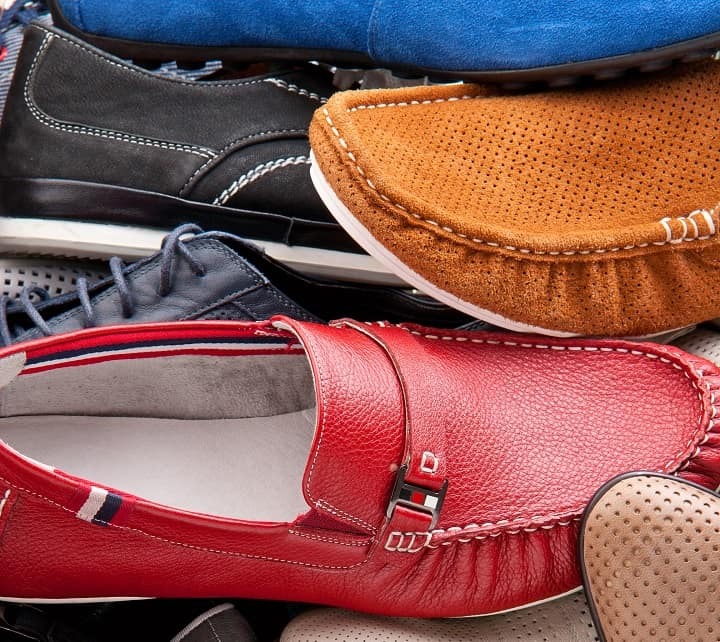 If there is a type of footwear that offers optimum versatility, then it must be men’s loafers. These shoes are ideal for men of all ages, and they can be worn with different pants and >all types of suspenders without watering down your sense of fashion. Furthermore, they go well with both casual and semi-formal clothing such as khakis, blazers and slacks. Just like chukka boots, men’s loafers are not only versatile but also stylish as well. Nowadays, shoemakers and designers have pushed their boundaries a notch higher by manufacturing highly stylish and innovative loafers. What is more amazing is that you can wear them with socks for men while remaining stylish. The fact that loafers are not overly fitted on the heel makes them comfortable and ideal for people with foot problems. People with conditions such as plantar fasciitis and heel spurs can wear these shoes comfortably without harming their feet. Loafers Material – Leather or Suede? Loafers are made using either leather or suede, or a combination of the two. Each of these materials has their own advantages and downsides. Loafers made using leather are more durable than their suede counterparts. They are tougher and more resilient to different terrains and weather conditions. Furthermore, leather loafers come with a sleek, shiny finish that is sure to grab your attention. They can be worn with a full suit or casual outfits depending on your preferences. For a more relaxed look, you may consider wearing your leather loafers with smart casual tailored separates and the finest x and y suspenders. Be sure to clean and polish your leather loafers regularly before wearing them, and they will serve you well for years to come. 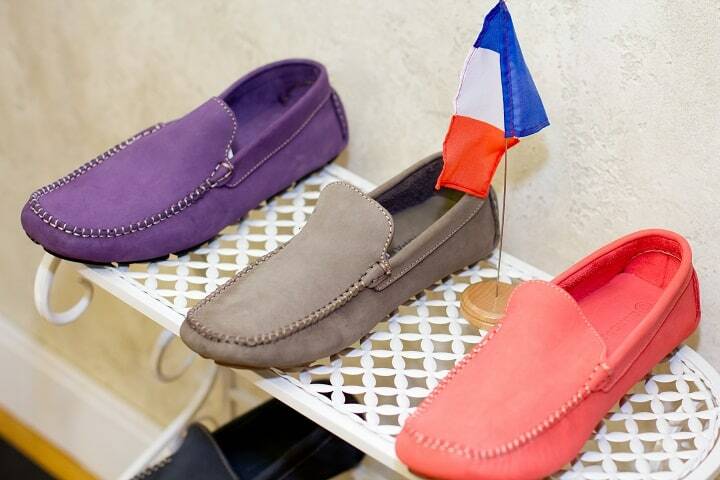 Suede loafers are exceptionally elegant and luxurious than leather shoes. They are normally reserved for special occasions due to their delicate nature. In essence, you cannot wear suede loafer in a wet winter morning simply because they tend to absorb water and moisture. This can be damaging to your expensive investment. If you have any respect for footwear, you should wear your suede loafers during summer or spring seasons when the conditions are relatively drier. Notably, suede loafers are best worn with casual outfits due to their laid-back feel. They look great with khaki pants or shorts and the best men’s jeans for the ultimate fashion statement. They can also be worn with formal clothing, but it will always be hard to knick the perfect look with these kinds of clothes. Penny loafers are arguably the most popular and most common type of men’s footwear available on the market today. They have been around for close to a century and they still rock with their classic look. The shoes are impressively smart and they work best with most outfits, especially summer attires. You can also match these men’s loafers with jackets, blazers, tailored shorts and chinos along with high-quality men’s belts. The Gucci brand does not need any introduction. However, many people often associate this brand with outfits rather than footwear. Well, Gucci introduced their first loafer into the market way back in 1953. The shoe is characterized by a distinctive style that includes a golden brass strap that comes in the shape of a snaffle, hence the name Snaffle loafers. The Gucci loafer design has evolved to become iconic, gaining recognition among the fashion industry’s elite. 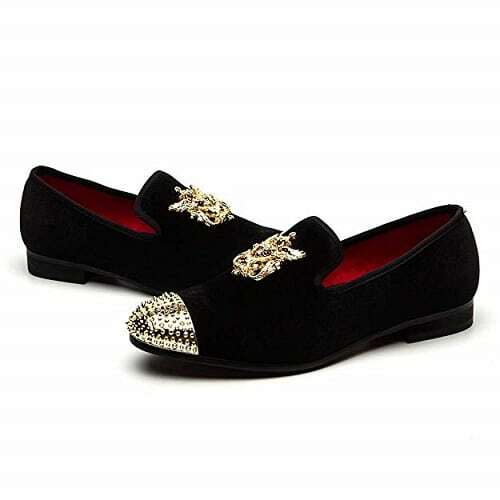 What is more amazing is that unlike other types of loafers the Gucci works best with both formal and casual outfits. 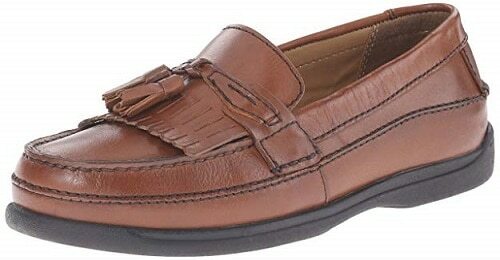 Tassel loafers, also known as Kiltie loafers are slip-on style shoes manufactured by the Alden Shoe Company. The design of the shoe was a brainchild of Paul Lukas who was a Hungarian-born actor. He wanted to mimic the tasseled Oxford style dress shoes that he once bought on a trip to Europe. However, the initial attempt did not deliver desirable results until the Alden Shoe Company took up the project. The Tassel loafers consist of a decorative, attractive lace that comes with tassels on the top. Furthermore, it is made from calfskin unlike other leather shoes that are mostly made from cow’s hide. They are extremely durable and the least porous of all types of loafers. For these reasons, they are somehow expensive but worth every dime. Furthermore, they can be worn with most outfits. 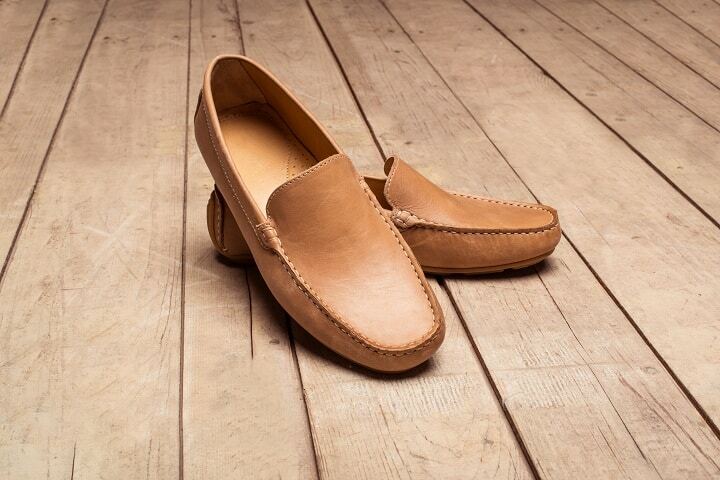 Moc loafers are the traditional Aurland Moccasins that were the first type of men’s loafers. They come with overcast stitching that makes them elegant and attractive. The availability of these shoes might be scarce, but wearing moc loafers still sends a strong statement to the fashion world. Choosing the best loafers for men might seem to be an individual decision, as it all depends on your personal tastes and preferences. In any case, the wearer of the shoe knows where it pinches. However, whether you are looking for the best chelsea boots or the best men’s loafers, there are various factors that you must consider when buying any type of shoes. Here’s how to choose the perfect loafers to suit your needs. 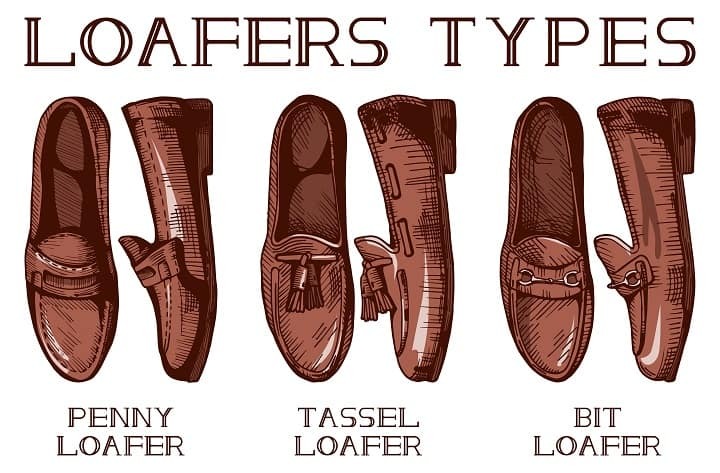 Loafers come in different types and styles. The type of shoes that you choose should match your personal tastes and preferences. You should also consider the function or occasion to which you will be wearing the shoes. For instance, Gucci loafers go well with all types of formal and informal functions while penny loafers are considered ideal for casual functions. The quality of the shoes says a lot about how much you value your wardrobe. It also determines how long the loafers will last. It all boils down to the materials used and the sole type. You should go for a high-quality loafer that is not only durable but also resistant to water or moisture. If the shoes have anti-skid soles, the better. In terms of size, it is always a wise idea to acquire the perfect fit. Buying loafers larger than the size of your feet is not a good plan, as it will only make it harder for you to walk comfortably as you cannot tie your shoes. However, some experts recommend that you should take one size bigger or go for shoes that have good expansion as the feet always tend to expand during the day. Make sure you try out the shoes before buying them even if you know your shoe size to avoid any disappointments later. In terms of design, you should look at aspects such as color, shape, weight and general aesthetics. These aspects will determine the kind of clothes you will wear with your shoes. Fortunately, modern men’s loafers are exceptionally sleek and elegant, and they come in different colors, shapes and designs. Some have decorative straps and laces that make them more attractive. Never compromise on comfort when buying men’s loafers. Fortunately, loafer shoes are exceptionally comfortable as most of them do not have heels while some have very low heels. The cushioning and padding should also be sufficient to guard your feet from strain and offer ample protection when walking or running. Price is not a major issue, but it remains among the many factors that you ought to consider. The best loafers for men do not come cheaply considering the fact that they are durable, versatile and of high quality. However, you are encouraged to stick to your budget whenever you are out in the market. Interestingly, you can take advantage of sales discounts and monthly offers to buy high-end shoes at a huge bargain. 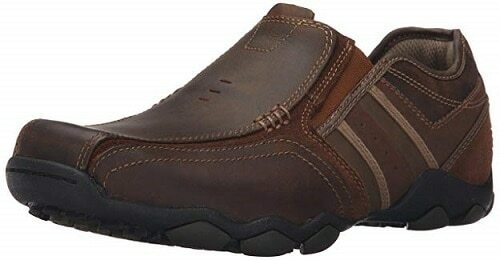 If you need a shoe that’s super comfortable and won’t cut into your Achilles tendon while walking, Skechers Loafers will exceed your expectations. They’re designed with high-quality canvas and non-slip rubber sole to provide your feet with comfort. Made of breathable material, they have a cushioned memory foam footbed and a lightly padded collar with a concealed gored inset at entry, all of which are thoughtfully meant to help you feel comfortable when walking. Unlike similar items, these slip-on loafers are easy to clean since they’re machine washable. They’re also designed in different colors and various fitting sizes for you to choose from. Well designed with high-quality materials, Crocs Santa Cruz 2 Luxe Loafer is super comfortable, stylish in look and reasonably priced. It has a fantastic drop, therefore, pressure and foot strike is more forward-directed and less heel-strike driven. Created with a highly refined, lightweight canvas on the upper, the interior of this item is perfectly fitted with the softest footbed and a memory foam pillow at the top of the Croslite foam base. You don’t have to worry about getting unnecessary, harmful pressure on your ankles or Achilles tendons, because this product is very supportive. It gives an amazing sink in softness and a resilient bounce back. 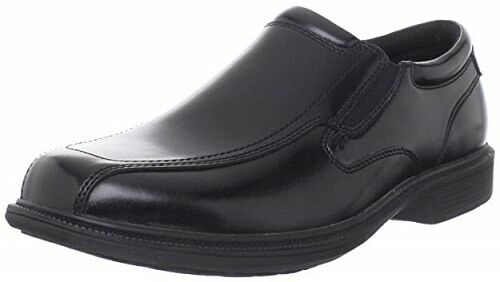 Dockers Slip-On Dress Loafer is a shoe that’ll take away all your worries about heel-slippage, narrowness or wideness. You’ll hardly get sores or hurt in your toes from wearing it. What most men love about it is the square toe-tip that allows your toes to spread out freely. Carefully constructed with motion and comfort in mind, these loafers have a nice cushion and offer long-lasting flexibility and support. The interior is fitted with sock lining and a great comfort gel heel insert. Expect no performance or comfort problems with this item because it’s proven to enable normal foot function and is excellent for enhancing foot health. If most shoes have done nothing more but to hurt your feet in the past, it’s time to ditch them for CLARKS Loafers, which are created to prevent discomfort and pain. They have an amazing design that includes a complete genuine leather on the upper and synthetic flexible sole. What makes them even greater is the breathable leather which doesn’t make your feet feel hot and stuffy. To reduce stress on your Achilles tendons and ankles, they’ve been fitted with a comfortable material on the footbed that feels soft to step on. If you have a light colored floor at home, this shoe is great for you since it doesn’t leave marks on the floors. Available in brown and black, it also comes in different sizes, so you can quickly pick your regular fit. In case you need a cool pair of greatly designed loafers, Cole Haan is the option you may want to consider. Apart from looking nice, they also provide an all day long foot comfort. They have a fantastic design that consists of full leather lining and a flexible rubber outsole that’s slip-resistant. The eye-catching stitch detailing on upper offers reinforcement to make the shoe more stable. Created with a shaft that measures about 3 inches from the arch, these loafers are great for casual nights because they support Achilles’ tendons and prevent ankle strain. They’re available in a few colors and you also get the choice to easily find you a standard fitting, since it is designed in various sizes. Practical and well designed, Nunn Bush Loafer performs just as great as it looks. A lot of emphases have been placed during construction to ensure that it’s much more comfortable to walk with than with other similar products. Made of 100% leather, it’s also developed with a dual density midsole and a flexible, rubber outsole with an amazing grip to prevent slipping. The interior has a decently cushioned footbed with a comfort gel at the heel to help in providing you with all-day comfort. Its suedetec lining has breathable properties that give feet great comfort and reduce bad odor. 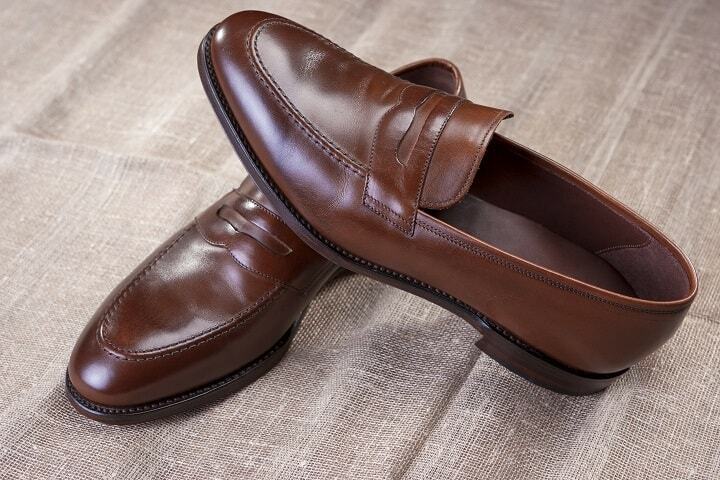 Upper consists of genuine leather with a classic shine to make you look groomed all day long. Most men like this shoe because it lasts longer and can retain an attractive appearance with less maintenance. Do you need a perfect fit, a classy style and incredible comfort all packed in one shoe? If your answer is yes, then Jitai Loafers are the best you can get. This shoe is like no other on the market. It’s constructed with velvet upper and a flexible sole that promotes walking comfort. Its inner sole is cushioned with great quality material to give your foot comfort and soft feel. Also, it has a heel that’s about 0.75 inches, therefore you can comfortably use or wear it for most of your daily routines and not feel the hurry of getting it off your feet. 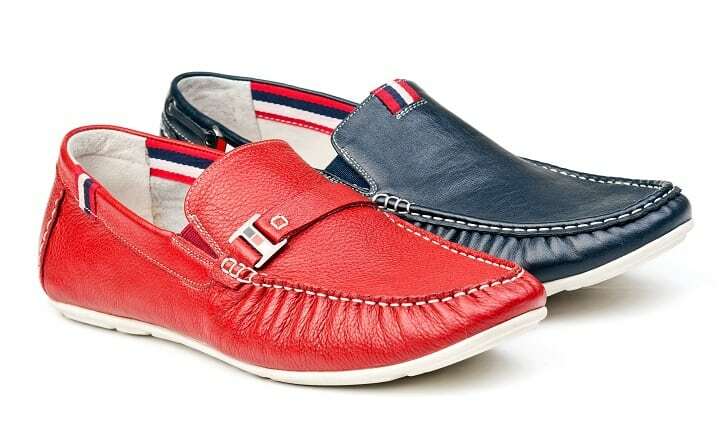 Comfort, attractive look and great quality are what you’ll get when you acquire Go Tour Loafers. Most men of style like matching this shoe with their favorite jeans and top for a greater look. Its excellent, slip-on design allows you to put it on or take it off quickly. It’s also created with a lightweight and high-quality, flexible material which makes it the most comfortable loafer on the market. The leather upper looks very attractive with an amazingly detailed stitching throughout. Men also love this shoe because it makes their feet look even more attractive. If you also need an affordable slip-on loafer that lasts, you may want to consider this one. It has a long lasting rubber outsole that provides traction on various surfaces. If you are always on your feet because of the nature of your work or daily routine, then you need Dockers Sinclair Casual Kiltie Loafers. 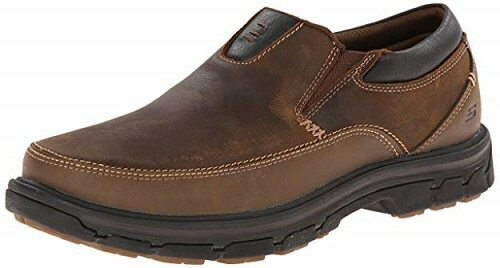 This shoe is indeed of high quality and combines excellent look, comfort and durability in one. It performs amazingly in preventing your feet from getting sore thanks to its cushioned footbed and a microsuede cover which offer a pillow-like softness and comfort. This shoe looks very classy with its genuine soft leather upper and stylish tassel accent. Most men like matching it with casual slacks, khakis or jeans for a fantastic, fashionable look. The heel is about 0.75 inches which makes it extremely easy to walk around with. Its outsole is made of flexible rubber with a great grip to enhance stability and prevent slip. Well built with leather and rubber sole, Skechers Diameter-Zinroy Slip-On Loafer will make walking a very comfortable experience for you because it fits almost perfectly. The outsole is composed of flexible rubber for high traction and the interior is fitted with memory foam insole for a soft feel and comfort. There’s also a low profile shock absorbing midsole. If you are going for a long walk, you don’t have to worry about your feet getting too stuffy and hot. This is because this item has perforations accent at the side and front for a cooling effect. A soft padded collar makes it easy for you to slide your feet in or out of these loafers. Perfectly constructed with pure leather on the upper and flexible thin rubber sole, Cole Haan Pinch Tassel Loafer is very comfortable for walking. With a stacked heel that measures around 1 inch, you can comfortably wear this shoe for most of your daily routines with minimal chances of hurting your ankles or your Achilles’ tendons. Other than being comfortable this loafer is also very beautiful in appearance. It has a stylish tassel accent at the top and an awesome stitch detailing. The leather is of great quality and very easy to clean. Designed with excellent width and the footbed, it’s also fitted with a soft memory foam insole for extra foot comfort when walking or standing. If you’re searching for a high-quality and comfortable leather shoe, look no further because LOUECHY Liberva Loafer is the perfect choice to make. It has a lightweight and flexible design that makes it easy to wrap around the feet for exceptional comfort. There’s also a hand stitched leather upper that’s perforated. This allows feet to breathe easier and adds extra comfort. The breathable property also helps minimize bad odor. This shoe has a rubber outsole that’s long-lasting. Furthermore, it has a cushioned footbed that feels soft and absorbs shock. Available in different colors and sizes, you can match it with your favorite jeans or top and you can even decide to press down the heel as cap-slipper for extra comfort. Constructed with a non-slip sole, pure leather and soft materials, Skechers Segment Slip-on Loafer never disappoints when it comes to providing comfort and maintaining great walking stability. It has an amazing rubber and flexible outsole that’s slip resistant. It also has a soft, cushioned footbed and gel-based memory foam comfort insole. Wearing this shoe will almost feel like stepping on a pillow. Design features a soft padded collar and contrast stitching with an amazing inset pull tab at the tongue. This product is designed to fit perfectly and to feel comfortable. If you are working long shifts, you can depend on it to wrap around your feet nicely without making you want to take it off. If you are looking for a stylish shoe that’ll make you the center of attention wherever you show up and earn you plenty of compliments, Calvin Klein Menton is the best you can ask for. With its cushioned footbed and heel that’s about 0.5 inches, it’s great to be comfortably worn in the office or for your daily routine. 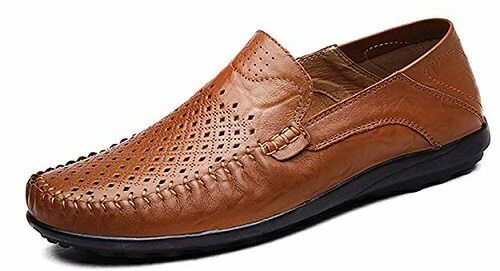 This loafer is ideal if you are a guy that likes to match clothes with shoes. You can easily wear it with either casual or elegant clothes. Most men also like it due to the soft removable insole that allows more access to the interior for easy cleaning. You can also replace the inside sole with a thicker one for extra comfort. Designed with genuine leather, thick insole and synthetic sole, Crocs Santa Cruz 2 Luxe Loafer is exceptionally comfortable for a long walk or standing for prolonged periods. It has an amazing design that features elastic gore to provide a snug fit and has a great memory foam based footbed to allow your feet to rest comfortably without feeling any pressure that can hurt the ankles. Most men love it because, unlike other brands in the market, it fits perfectly without leaving the extra room that can make your foot slip while walking. For even more comfortable walking experience, this shoe is fitted with soft memory foam at the top of the crostlite foam base. CLARKS Cotrell Free is thoughtfully designed with the intention to help you feel more comfortable than when walking with any other loafers in the market. It’s also lightweight, fits perfectly well and looks great on the feet. Additionally, it has a flexible rubber outsole with good grip to prevent your feet from slipping. The footbed is nicely cushioned with soft materials, so your foot can rest comfortably for easy walking. You can wear these loafers to work, not just because they look great but also because they have a heel that measures about 1.57 inches. This height helps to enhance stability and comfort for more natural movement. The impressive, classy look comes from the genuine leather upper and excellent stitch detailing. 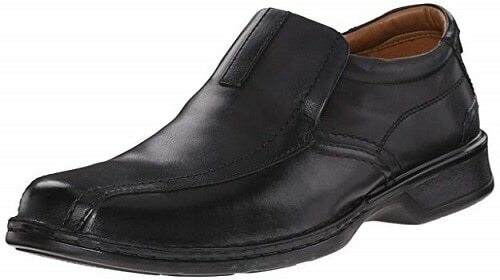 Cole Haan Howland Penny Loafer will be ideal for you if you’re looking for a shoe that fits narrow feet and can be worn both with or without socks. It has a long-lasting, synthetic outsole with a subtle heel that measures about 0.25 inches in height and helps enhance your walking stability and comfort. The synthetic outsole also improves the grip to prevent slipping. This item has incredibly smooth leather lining and lightly cushioned leather footbed that feel soft to step on. The shoe itself is also lightweight hence very comfortable to walk around with. It’s available in different color and sizes for narrow feet. Most men love the design that features awesome split pod sole with driving heel and moccasin stitching. Wearing loafers is simple and easy. However, if you need to make crucial decisions when styling in order to make a strong fashion statement. For instance, you have to decide whether to wear your loafers with or without socks. You also have to look at factors such as the trouser length and type of attire especially when deciding between casual and formal outfits. For obvious reasons, you cannot wear loafers with men’s pajamas even if you want to make the greatest fashion statement. Loafers are worn with either casual outfits or tailored formal clothing. If you prefer wearing a suit with loafers, always factor in the length of your trousers. The pants should have a slight break so that you can see the detail of the loafers. Also, trim your beard if you have one and apply the appropriate aftershave for men for the ultimate full suit look. For the mod-inspired look, wear a cropped or tampered trouser with your loafers. The trousers should be slim to deliver a contemporary look. Remember to wear men’s silk boxers for extra comfort especially when wearing slim, tight trousers. Loafers without socks simply look austere and comfortable. However, no-show socks or ankle socks would be ideal to avoid perspiring excessively especially during summer. Nevertheless, if you decide to stick to staying sockless, then consider applying powder to your feet to avoid sweating and smelly feet in dry weather. A pair of men’s loafers is not a cheap investment. For this reason, you must take care of them by cleaning and polishing your loafers regularly. This is crucial to enhancing their lifespan. It will also maintain their shine while keeping the leather or suede looking fresh at all times. You also need to invest in polish or cream depending on the type of material your shoe is made from. Buy the exact color to your shoes to avoid discoloring them. Here’s how to take care of your leather or suede loafers. Alternatively, you may just take them to a professional shoe-shiner for cleaning and polishing. Will loafers stretch over time? Like all types of leather shoes, loafers do stretch over time due to tear and wear. However, this does not mean that you buy small, tight shoes hoping that they will stretch later. Loafers Vs boat shoes – which are better? Loafers are far much better than boat shoes since they can be worn with all types of outfits, including formal and casual attire. In contrast, boat shoes are sportier and they are worn best with casual outfits only. Men’s loafers continue to rock the fashion world, and from the look of things, they will continue to rise in fame. These special and unique shoes are not only elegant but also extremely practical. Moreover, they have survived for close to a century-defining every step of the fashion industry. With this in mind, there is no reason why men’s loafers should miss in your permanent shoe collection. Photos from: 0635925410 / depositphotos.com, photobac / depositphotos.com, dimamorgan12 / depositphotos.com, istryistry / depositphotos.com, victorO / depositphotos.com.